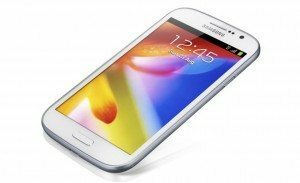 The Samsung Galaxy Grand i9082 is a device released with a dual-core processor, 5-inch screen and 8-megapixel camera on the back. These features are sure to get a good response from consumers. We will show you three methos to restore the factory settings of this device. The first methos is to be used when the user has no access to the Android operating system, either because of an error in the system or because the user forgot the unlock pattern for some reason. The first method to reset Android that we are going to explain, will involve entering the recovery mode of the device and from there restore the phone to factory settings. With the phone turned off, press the home button (center) and the power button together, the phone vibrates and you will see an android on the screen. At this poing release the buttons. Select “Yes – Delete all user data” and confirm again. The phone will start a process, wait until it’s done. With these steps we will have unlocked Android’s Samsung Galaxy Grand i9082. If we have access to the device menu and only want to restore the factory settings for maintenance or any other reasons, this method will serve to perfection. It’s easy and very quick to apply. Wait for phone to restart as if it had never been used. There is a third way to unlock to unlock Android on the Samsung Galaxy Grand i9082. It’s much faster and easier, and it involves inserting a direct restore code. To do that we dial * 2767 * 3855 # and wait while the phone does all the process automatically. Today we learned three simple methods of how to unlock Android in Samsung Galaxy Grand i9082, as usual if you have any questions, leave them in the comments section. I have a samsung grand duo I9082 and forgot my lock pin. I have tried doing a hard reset with the home button and the power button. However the unit just goes to the bootup sequence and boots to the pin entry screen. I have also tried to dial the secret code,however, the unit only returns “this is not an emergency number”.